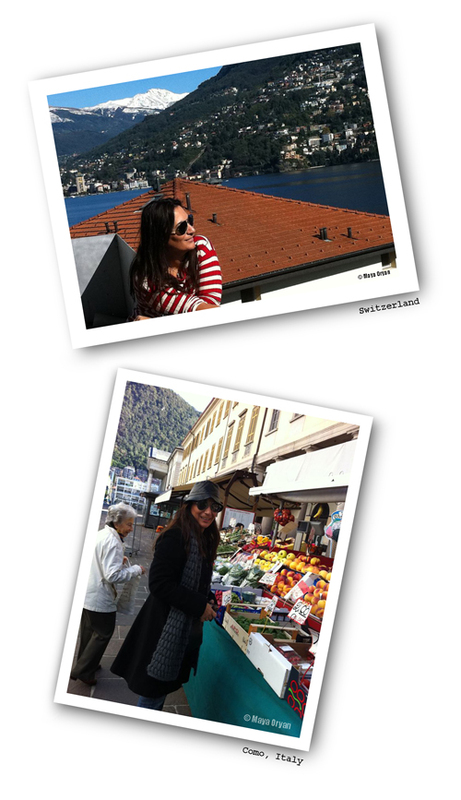 During the last few years, Milan has been an addictive destination to me! No matter where I wanted to go in Europe, it has to be via Milano. Partly is for the shopping of course but mostly is for the bounties of Italy. I’m in love with this country, the nature, the culture, the traditions, the walks and obviously the food! Last week I was there with my dear friend Nidal. We had a blast! We enjoyed every bit of our stay. On our last day, we drove north to the town of Como. We walked around the small streets then went to see one of the top travel destination in Italy, lying between Milan and the border of Switzerland, the Lake Como. Wow! Beautiful! I think my heart has stopped beating for few seconds. After Como we crossed the Swiss frontiers visiting Lugano, where we had lunch, bought Gruyere cheese and Swiss chocolate and walked the stretch along the Lake Lugano. I was surrounded with breathtaking scenery! I stared at the deep blue water, the mountains and the white peaks in disbelief, thinking this is all I wanna do, everything else can wait! Zap to reality, to Lebanon, with its never-ending political issues and stressful events bursting every now and then. Inspired by my trip and all fused with my passion for Italian cooking, I decided today to bake a Pizza. This recipe uses fresh onions, garlic, mushroom and scented thyme. I sprinkled fresh garden basil over the Mozzarella and the Gruyere cheese, to give it a little extra flavor and fragrant. Unfortunately, it’s not the best shot I have on my website, next time I make the same recipe, I’ll try to take a better picture. I would be lying if I say that I make Pizza often. It’s so easy to prepare, but for some reason I always manage to forget about this recipe. And when I do it, I’m always proud of my achievement, which earns me big smiles from my hubby and girls! In a jug, dissolve the yeast and sugar in water and let stand for 10 minutes or until frothy. In a large bowl, sift flour and semolina together. Add salt. Make a well in the middle. Add oil to the yeast mixture and pour it in the centre of the well. Start mixing, bringing the flour from the edges to the middle. Add water and keep kneading to form a springy large ball with the dough. Cover the dough with an oiled sheet of cling film and return to the bowl. Cover it with a kitchen towel and leave the dough to rise about ½ an hour or until it has doubled in size. To make the topping: In a saucepan heat oil and sauté onions and garlic for 3 minutes. Add tomato sauce, ketchup and mushrooms and cook for a further 2-3 minutes. Season with oregano or pizza seasoning and salt and pepper. Off the heat add the thyme and the olives and mix. Remove the dough from the bowl and roll out on a floured surface to form a rectangular shape. Place it in the mold pushing out the edges evenly. For thick dough, it should be no more than 1cm. Brush the dough with the tomato Passata sauce and spread the topping evenly over the pizza base and sprinkle with Gruyere and Mozzarella cheese. Bake in a preheated oven 200°C for 20-25 minutes or until the dough rises and turns slightly golden. 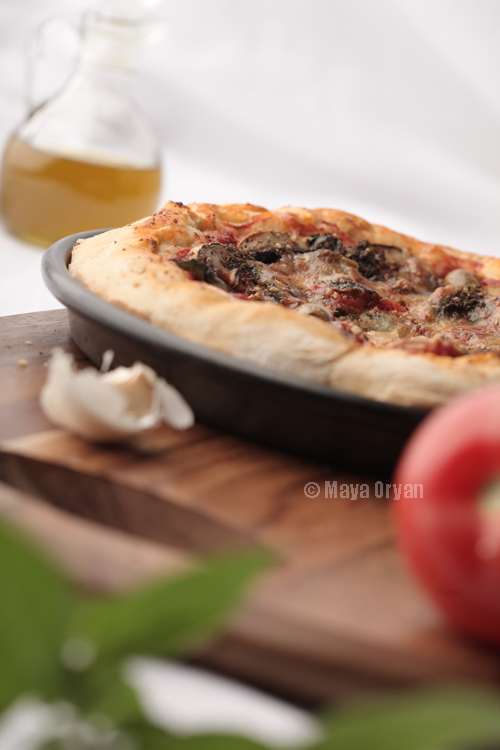 This entry was posted in Main Course, Recipes, Uncategorized and tagged Baking, basil, food photography, Ham and Cheese Pizza, ham slices, Italian recipes, lebanese food blogger, Lebanese food stylists, Maya Oryan, Mayas Ingredients, Mushroom, olives, oregano, Pizza, Pizza dough, thyme by Maya Oryan. Bookmark the permalink. Such a simple combination ingredients, but so effective – it looks delicious! mmmm. My mouth was watering when I was reading about the gruyere cheese and swiss chocolate in Switzerland. It sounds like a wonderful pizza to make when the kids are away – they don’t like mushrooms, but we love them! It sure works without the mushrooms:) Bon appetit! Thanks for the following..You Blog is excellent..